Space Horror? Try Space Bore! Ever wondered why we’ve never returned to the moon after Neil Armstrong’s phenomenal giant step for mankind? NASA astronauts Ben and Nate are about to find out. In Apollo 18 Ben and Nate land on the moon in what is supposed to be a standard mission, make sure all is in tact, and plant the American flag. After just two nights, they wake up to find the flag and their equipment all mangled and destroyed. They also find tracks that don’t look quite human. Ben and Nate decide it’s time to high-tale it on outta there only to find that someone or something doesn’t want them to go. The two astronauts WILL find out why we haven’t returned to the moon but it might just be too late for them. The line that caught my attention to this film was the when the trailer voiceover asks, “Ever wonder why the U.S. has never returned to the moon?” My response to that was, “No, but I do now.” Not that I went and watched the movie expecting the truth, but you have to admit it’s intriguing right? Unfortunately though, with such a hook, the movie stunk, and was a stinker (did anyone get that?) The few redeeming qualities consisted of pretty decent acting, suspense and intrigue. 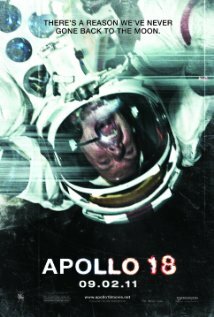 But the movie’s uniqueness is based on the discovery of a bunch of old footage from the Apollo 18 mission. But the pieced together footage was hard to watch! It was like looking through a backwards-magnifying glass, and it was so shaky that I found myself getting dizzy! 120 minutes of waiting for something to happen, ending in a finale that was the only decent part of the movie. So if you want to see the movie and feel good about spending the dollar, then just fast forward and watch the last 10 minutes! I set all of my filters to medium so that I would be spared any parts that might keep me awake at night. I’m not sure what I missed in that respect, but I did feel lucky to not have to hear a whole bunch of swear words. There were also quite a few scenes that were cut because of vulgar “locker room talk”. The element that would keep me from EVER letting my young kids watching this is the suspenseful intensity of the film. Of course, it amounts to absolutely nothing, but there are a couple of scenes that do show one of the characters who has been bitten by one of the mysterious spider looking aliens, and as he slowly loses his mind he becomes zombie like. The “aliens” are super creepy if you hate spiders, which I did so I had to look away because one scene shows them literally eating one of the astronaut’s face. I would say Apollo 18 isn’t suitable for anyone under the age of 15. Trisha~ If Aliens do exist in a spider-like form, I’m in BIG trouble! !